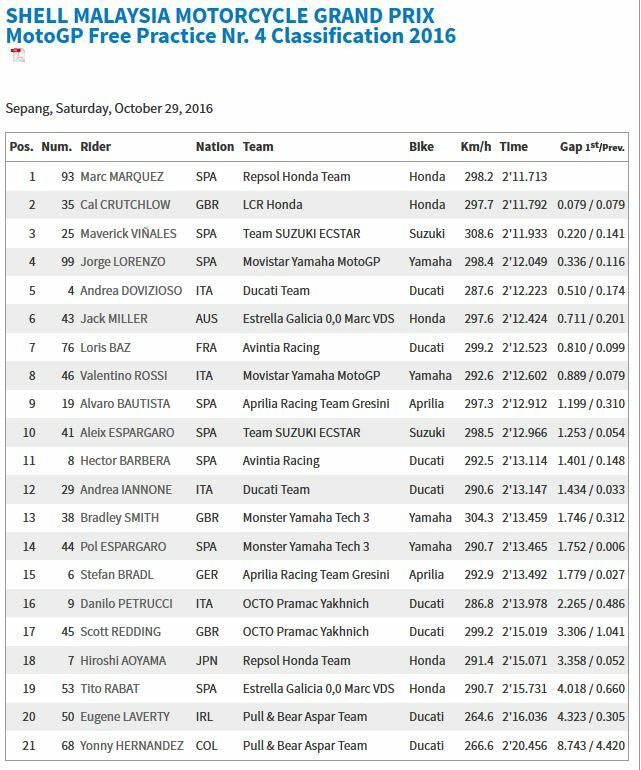 Cal Crutchlow (LCR Honda) was the early leader in a wet Free Practice 4 session at Sepang International Circuit, until freshly crowned World Champion Marc Marquez (Repsol Honda Team) just pipped him to the post as the flag waved. 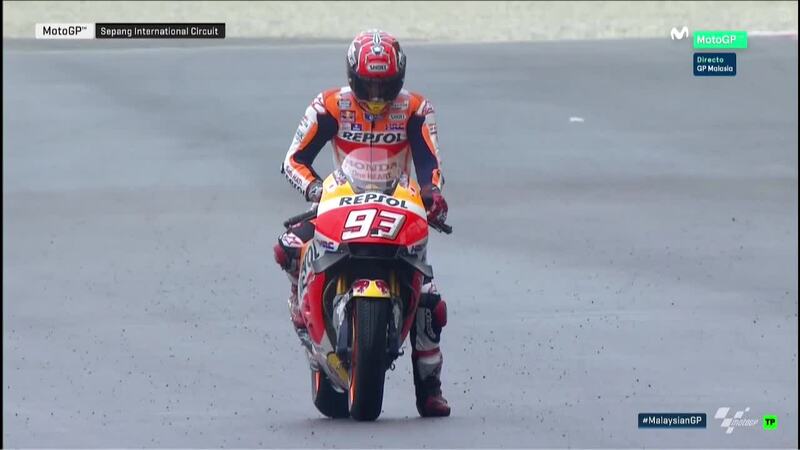 Maverick Viñales (Team Suzuki Ecstar) was third quickest, ahead of a good wet weather showing from 2010, 2012 and 2015 World Champion Jorge Lorenzo (Movistar Yamaha MotoGP), who suffered less with Michelin front wet tyre temperature in the hotter temperatures of Malaysia. Andrea Dovizioso (Ducati Team) completed the top five in front of a late charge from Assen winner Jack Miller (Estrella Galicia 0,0 Marc VDS), with Avintia Racing’s Loris Baz in P7 with some more wet weather magic from the Frenchman. 9-time World Champion Valentino Rossi (Movistar Yamaha MotoGP) hit some traffic on his fastest lap attempt, ending the session in P8, with Alvaro Bautista (Aprilia Racing Team Gresini) and Aleix Espargaro (Team Suzuki Ecstar) completing the top ten. The grid now head out for Q1 as Crutchlow looks to move through to Q2, and then qualifying positions at the head of the grid get decided in Qualifying 2.